"A delicious bread with a very light center with crunchy crust. You may substitute butter or vegetable oil for the lard if you wish." In a large bowl, dissolve yeast and sugar in warm water. Stir in lard, salt and two cups of the flour. Stir in the remaining flour, 1/2 cup at a time, beating well after each addition. When the dough has pulled together, turn it out onto a lightly floured surface and knead until smooth and elastic, about 8 minutes. Deflate the dough and turn it out onto a lightly floured surface. Divide the dough into two equal pieces and form into loaves. Place the loaves into two lightly greased 9x5 inch loaf pans. Cover the loaves with a damp cloth and let rise until doubled in volume, about 40 minutes. Bake at 375 degrees F (190 degrees C) for about 30 minutes or until the top is golden brown and the bottom of the loaf sounds hollow when tapped. See how to make traditional sandwich bread. I made rolls with this recipe instead of bread. It was a big hit at our Thanksgiving Dinner. Everyone raved about it. 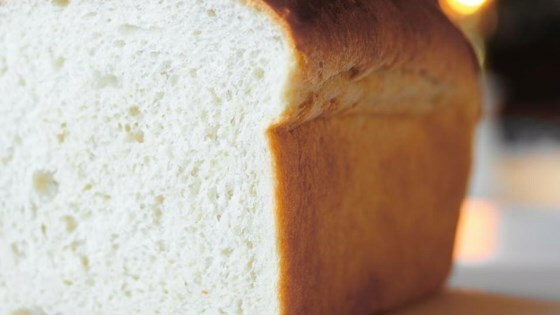 If you have never made bread in your life before, this is the recipe for you; very easy and bread turns out fantastic. This will be a new "family recipe" for our family. thanks for posting it! !